Live music fans still mourning the popular downtown music venue SLO Brew’s closure can now rejoice a bit: The company’s new venue has been approved to open. Concertgoers who want to celebrate The Rock’s opening will only be offered concerts on Friday and Saturday nights, with no cocktails or shots available to accompany the craft beer. ROCK OUT, BUT STAY OFF THE ROCK: The SLO City Council approved live music for The Rock music venue proposed by SLO Brew. Those rules were part of the proposal approved by the SLO City Council on April 19. 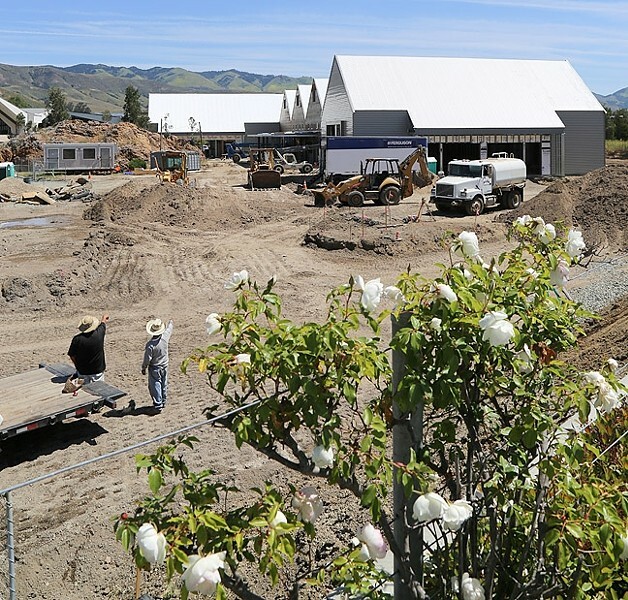 SLO Brew owner Hamish Marshall plans to build the concert venue at his facility at 855 Aerovista Place near the airport, which also includes an expanded brewing facility, a distillery, and a restaurant and beer garden. Some neighboring residents are worried about heavy traffic impacts, noise from both the live music and potentially rowdy showgoers, and the potential for decreased property values as a result. Marshall and a sound engineer consultant said the noise generated from concerts would not be significant once it reached the neighboring houses—which are approximately 1,000 feet or more away—and that it wouldn’t reach the level of sound generated by airplanes flying in or out of the airport or by vehicles traveling on Highway 227. He also downplayed some of the general concerns, saying that those were partly generated by the “nightclub” zoning classification for which the business fell under. Speakers at the City Council meeting’s public comment time were evenly mixed between supporters and those with concerns. A few neighbors said their initial concerns were alleviated after Marshall reached out to discuss the project. The venue itself would hold a maximum of 600 people (the former downtown venue’s max was approximately 450 people) and would be adjacent to an outdoor beer garden. Events will only be permitted during the weekends, with live music limited to Friday and Saturday nights. Marshall said the proposal was crafted to keep focus on the brewery’s new-and-improved brand and to address existing concerns, including the decision to not serve hard alcohol and to end shows by 11 p.m. He said that those decisions will help to avoid creating a strain on existing public safety resources. He even ventured to say the facility would help alleviate traffic along the congestion-plagued Broad Street/Highway 227 corridor. “I can absolutely offer an argument that the brewery, whether there’s concerts there are not, would actually reduce traffic because people will be stopping to see us,” he said. That irked one vocal city resident. “I’m very concerned that the owner is advertising stopping and drinking on the way home,” said Mila Vujovich-LaBarre. Some residents that live in area felt differently. Healy said she wasn’t worried about the noise in a place where the sounds of planes and trains are already commonplace. Other residents said the venue would be a much-needed asset to the city’s live music and entertainment portfolio. The City Council’s approval stipulates that live music isn’t allowed before 7:30 p.m., no amplified music is allowed on the outdoor patio, and doors and windows must be closed during indoor performances. Many of those stipulations reflected requests from speakers, including SLO City Council candidate Mike Clark and Carolyn Smith, representative of the community group Residents for Quality Neighborhoods. At the request of Mayor Jan Marx, the emblematic rock on the property, identified as a sacred site for the Chumash, is strictly off limits.